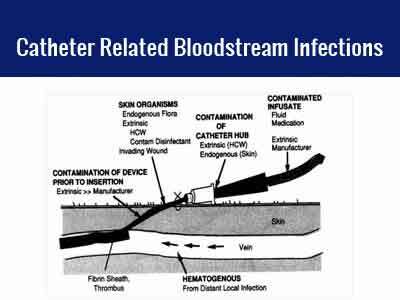 Catheter-related bloodstream infections (CRBSI, also called catheter-related sepsis) is defined as the presence of bacteraemia originating from an i.v. catheter. It is one of the most frequent, lethal and costly complications of central venous catheterization. It is also the most common cause of nosocomial bacteraemia. Although the use of central venous catheters (CVC) is increasing, there is evidence that the problem of CRBSI can be reduced. Palpation of the insertion site should not be performed after the application of antiseptic, unless aseptic technique is maintained. Maintain aseptic technique for the insertion and care of intravascular catheters. Wearing clean gloves rather than sterile gloves is acceptable for the insertion of peripheral intravascular catheters if the access site is not touched after the application of skin antiseptics. Sterile gloves should be worn for the insertion of arterial, central, and midline catheters. Change the dressing on intravascular catheters using aseptic technique. Use aseptic technique including the use of a cap, masks, sterile gown, sterile gloves, and a large sterile sheet for the insertion of Central venous catheter (CVCs, including peripherally inserted central catheter- [PICC]) or guidewire exchange. Use either sterile gauze or sterile, transparent, semipermeable dressing to cover the catheter site. Replace the catheter site dressing if the dressing becomes damp, loosened, or visibly soiled. Replace dressings used on short-term CVC sites every 2 days for gauze dressings. Replace dressings used on short-term CVC sites at least every 7 days for transparent dressings, except in those pediatric patients in which the risk for dislodging the catheter may outweigh the benefit of changing the dressing. Monitor the catheter sites visually or by palpation through the intact dressing on a regular basis, depending on the clinical situation of individual patients. If patients have tenderness at the insertion site, fever without obvious reasons, or other manifestations suggesting local or BSI (Blood Stream infections), the dressing should be removed to allow thorough examination of the site. Select the catheter, insertion technique, and insertion site with the lowest risk for complications (infectious and noninfectious) for the anticipated type and duration of IV therapy. Avoid using the femoral vein for central venous access in adult patients. Use a subclavian, rather than a jugular or a femoral site, in adult patients to minimize infection risk for nontunneled CVC placement. Promptly remove any intravascular catheter that is no longer essential. Do not routinely replace central venous or arterial catheters solely for the purposes of reducing the incidence of infection. There is no need to replace peripheral venous catheters more frequently than 72—96 hours to reduce the risk of infection and phlebitis in adults. Leave peripheral venous catheters in place in children until IV therapy is completed, unless complications (e.g: phlebitis and infiltration) occur. Develop a surveillance system to study the incidence of CRBSI. Conduct active surveillance for CRBSI in units that care for patients undergoing ventilation who are known or suspected to be at high risk for CRBSI. Collect data that will support the identification of patients of CRBSI and calculation of CRBSI rates.